Black Friday is on the horizon and you’ve already been inundated with the inevitable onslaught of advertisements. Impulse purchases will be made. People will line-up overnight and fight for the last big-screen TV. And next year, a bigger, better TV will be fought over. Black Friday is annual reflection that our economy revolves around the consume, toss, repeat cycle. But what happens after people are done with household goods for whatever reason, be it change of taste, death, downsizing, moving? They often end up at a thrift shop. Maybe your kid has outgrown her stuff, or you’ve read Marie Kondo’s bestseller subtitled The Japanese Art of Decluttering and Organizing and decided that many items in your life just don’t give you the feels. You organize a few boxes and make a drop. Those donations come from 20 boxes in the region, amounting to 16,000 pounds per week of stuff. 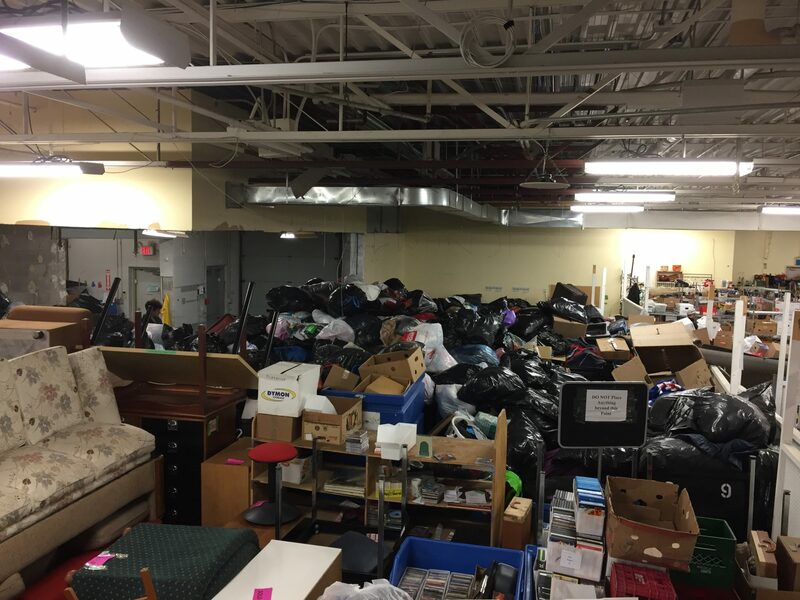 Donations are sorted in a 12,000-square-foot storage space at the back of their Merivale facility, priced, and put out at the Merivale storefront or delivered to their West Wellington location. So what happens to all this stuff when it comes in from the cold? Those donations come from 20 boxes in the region, amounting to 16,000 pounds per week of stuff. 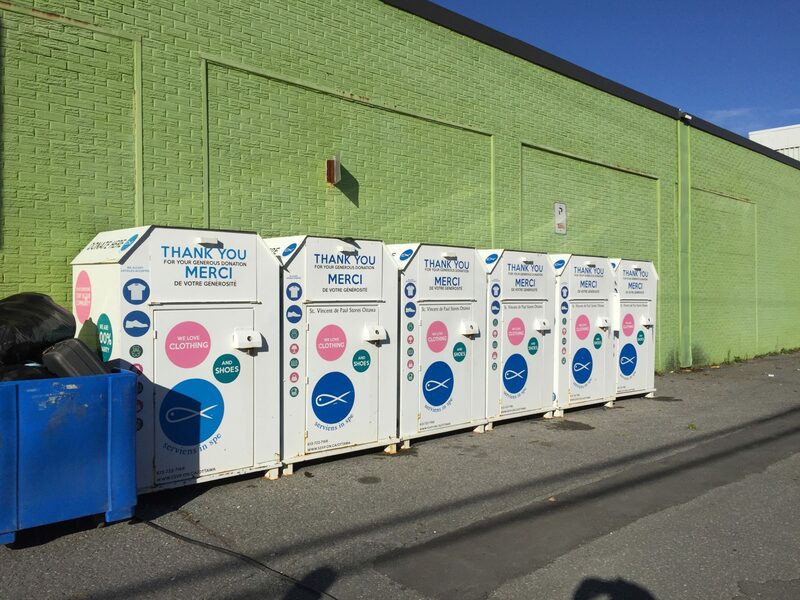 Donations are sorted in a 12,000-square-foot storage space at the back of their Merivale facility, priced, and put out at the Merivale storefront or delivered to West Wellington. St. Vinny’s has two trucks working 16 hours a day to pick up and drop off goods, so things are turning over constantly to keep interest high. Not all bins are created equally — some are actually for profit. Powell and others at SVDP are working on an awareness campaign in the hopes that people will look for a registered charity number on the face of the donation bin. Donations of stuff can add up to a lot of money. In 2016, sales at St. Vincent de Paul stores in Ottawa amounted to just over $3 million dollars — and 92 percent of that went back into poverty relief work, which has been the organization’s mission since it was founded in Paris, France, in 1833. Indeed, that value has led to thefts of donation bins in Gatineau. 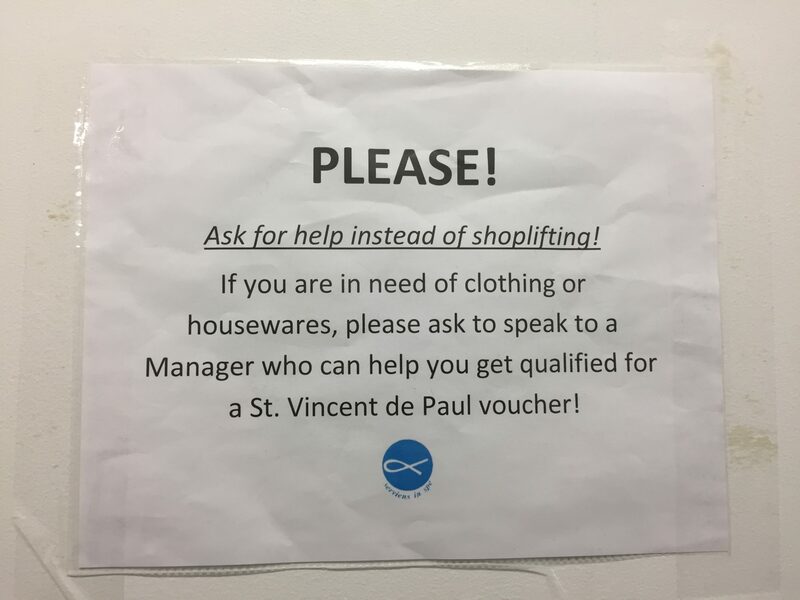 “Theft happens on a near daily basis,” says Scott Morrison who manages donations for St. Vincent de Paul. “This is ongoing for charities.” He says people will rifle through what is left outside the SVDP doors or bins, take what is useable, and leave the clean-up to his team. That clean-up requires labour, trucks, and gas to get everything to the landfill. So, when you donate your stuff, are you helping or dumping? It depends on what you give. Clothes for the current season are always needed, and avoids the cost of storage. Make sure items are working, because when people donate broken and unusable stuff the SVDP sorting centre becomes the de facto recycling centre, and that takes funds away from poverty relief work. “I think we’re used as a dumping ground sometimes,” says Morrison, adding that up to 60 per cent of donations end up in the landfill. That said, they have a metal recycler who picks up the broken toasters and other small appliances, and Morrison is liaising with an e-waste organization for electronics. Tattered clothing goes overseas, which just externalizes our castoffs to other nations, with heavy costs — financial and environmental — for shipping. We hear a lot about plastic in the oceans and about the effects of fast fashion, both on the labourers who produce it (and who have to make the world aware of their working conditions via tags sewn into clothing) and by consumer calls for retailers to consider the effects of making clothes that fall apart quickly. Many people talk about The Fourth R — refuse, which follows reduce, reuse, recycle. There are even calls for bans against single use coffee cups and takeout containers. Many are asking if there is any point in acquiring things that can’t be reused down the line. Moreover, the question might be do we have enough end-to-end systems? Some fast-fashion stores offer to take their clothing back. E-waste recycling is in effect. Batteries can be recycled at the Ottawa Public Library. The Ottawa Tool Library offers occasional Repair Cafes, but what about everything else that is not useful, repairable, or wanted? Is it all destined for the landfill? What we need more of is incentives — for both producer and user — to return their goods. Kind of like when you bring empties to the beer store. What would the culture and environment be like if producers were required to consider the end-of-life phase of their products? Perhaps that should be the call on Black Friday and its counter campaign of Buy Nothing Day.